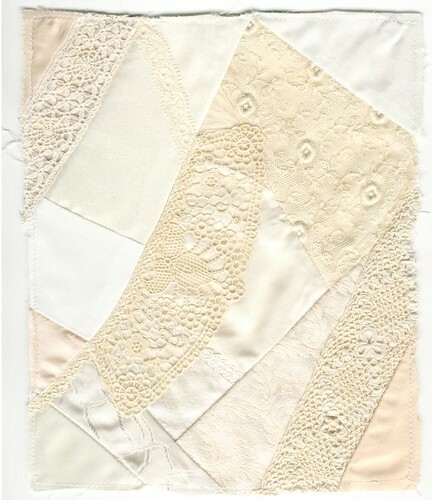 anlabyhouse: Cream on cream crazy quilt blocks. 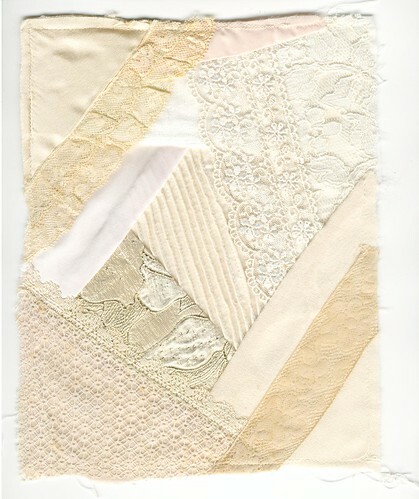 Cream on cream crazy quilt blocks. I have been working on culling my stash in the nicest possible way. 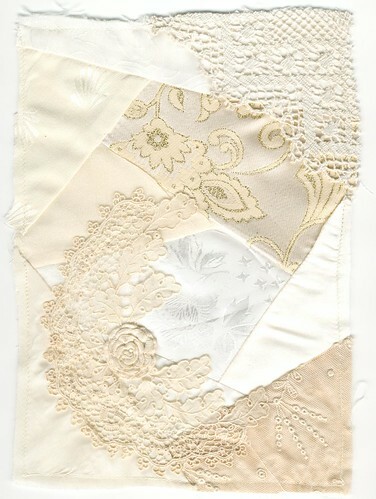 I had a large box of white, ivory, cream and antique cream coloured fabrics and another large box of antique lace pieces which have been gleaned from old garments, antique shops, eBay purchases and some that have been given to me. It seemed a shame to have them all squashed up together in a box so I am going to make a quilt for our queen size bed. My husband measured out the blocks and decided that I need to have twelve rows of eight blocks - that's ninety-six?? so far, I've completed ten! I should mention that any fabric pieces which appear to be a greyish colour or have what appear to be black threads running through them are in fact cream and threads are metallic gold. I will also do a tiny bit of gold metallic embroidery to liven up some of the blocks. At the moment, I'm not doing any embellishment or embroidery but I'm collecting cream coloured threads including two wooden reels of 1920s Pearsall's rayon embroidery thread. 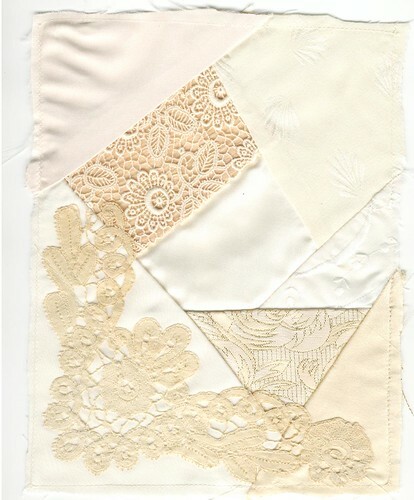 Here are the first four blocks using my favourite pieces of antique lace. How lovely. I think tone on tone is so wonderful. Your work is spectacular. I have seen a quilt like this before, Vivienne - a few years ago now, and I can't even remember who it was or where, but I will never forget the amount of work that had gone into making it, and the family heritage that had been brought together to make it. I would love someone to use my doilies (well,not all 700 of them!) to make me a quilt for our bed, but it will never happen!! I really like your conversation on lapel pins. I have a lapel pins secrets blog if you wanna come on over and check my stuff out. Exquisite information on lapel pins. I have a lapel pins secrets blog if you want to see some cool stuff. I would love to use a photograph of yours for a project! Could you email me at mewissa_lani@hotmail.com to discuss this?